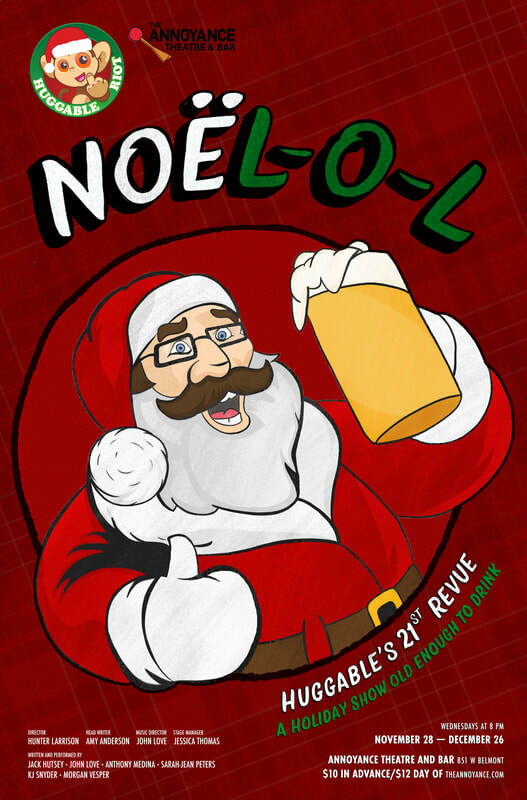 ​Huggable Riot decked the halls with snark and satire with its fourth annual holiday show, Noel-O-L. The 21st revue for the theater company continued the Huggable tradition of closing each year with a holiday show that is equal parts irreverent and heart warming. Noel-O-L is directed and head written by Huggable Riot co-founders Hunter Larrison and Amy Anderson, respectively, with music direction by cast member John Love and stage managed by Jessica Thomas. In addition to Love, Huggable Riot brings back writer/performers Jack Hutsey, Anthony Medina, Sarah-Jean Peters, KJ Snyder, and Morgan Vesper.